Let’s start coding! I suppose that you have Python 3.6+ and Node.js installed. 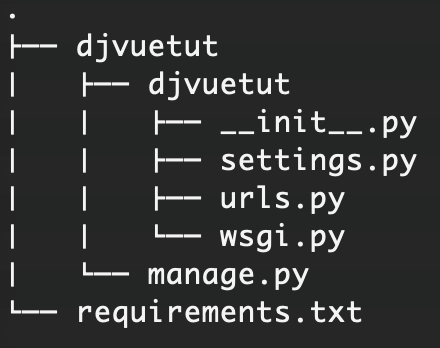 It is good practice to create and requirements.txt file to install our dependencies for Django. Press Control + D to save the file or install each library with pip manually. Enter the following and run requirements.txt to install Django and DRF, also with webpack loader package which we will need to make django to talk to vue. Your current file tree should look like this for the moment. You may want to test it and see that it runs in your browser. Ignore any unapplied migrations warning for the moment and let’s check http://localhost:8000 and make sure you have a running django app! click control + C to stop the server. Now, we will continue with Vue.js installation and setup. 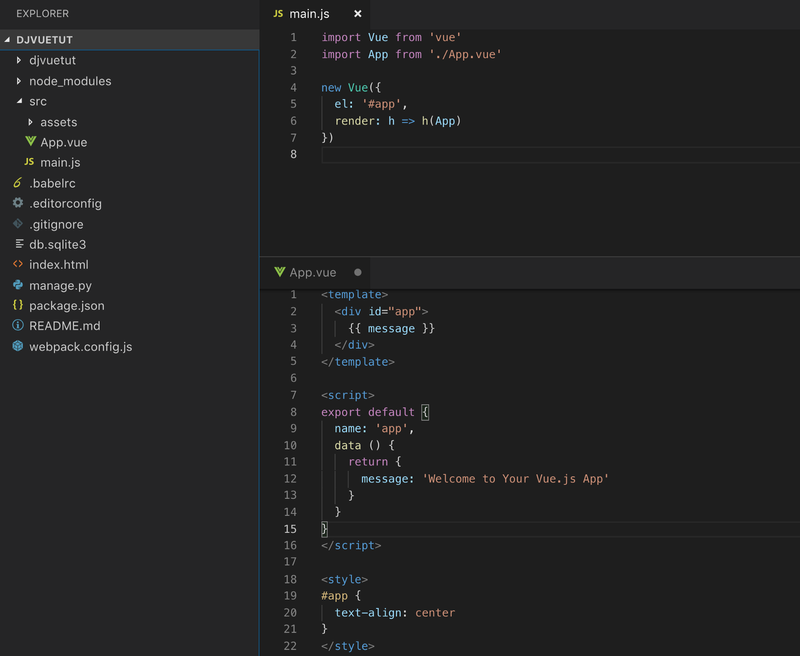 enter the commands below to install vue-cli and webpack with simle configuration. Default server port for Vue.js is 8080 so you can test that it runs at http://localhost:8080 if it doesn’t load automatically. → in App.vue we have the Vue.js system to enable us to render data into DOM using double braces syntax. Now we need some Vue.js plugins to integrate vue with django. We already installed django-webpack-loader package for django. It requires just a few settings to work. First we need to install the following plugin. we should be ready now. Run the latest commands below. Voila! 👏👏👏 when you route to http://localhost:8000 , you should be seeing your view in App.vue. Now you have a fully working vue.js app with a django backend. we have already installed DRF when we run our requirements.txt but we also need to add it to installed apps to let django know that we are going to use it. # I think creating a super user is self explanatory. We will use it later. 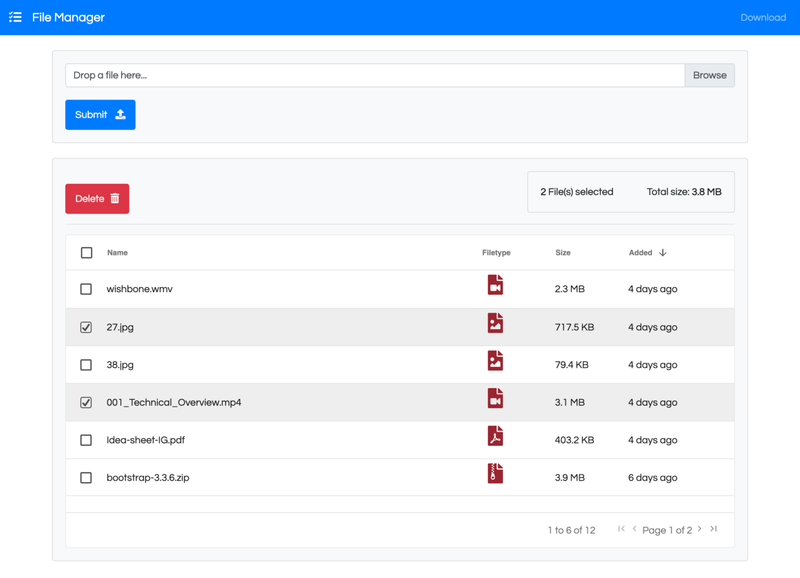 our model enables us to upload any file with any extension and size. We haven’t setup any validators yet, we will make the fine tuning later. We need to complete a few more configuration to make it work. we also need to configure our urls.py and define the new added folder as a static folder. we will define a folder called “media” to keep our files. It will be automatically created in our first upload. now, it is time to create a setup to be able to use DRF. Let me add the required code for each. After that I will give an explanation what they do in general. The ModelSerializer class provides a shortcut that lets you automatically create a Serializer class with fields that correspond to the Model fields. DRF allows you to combine the logic for a set of related views in a single class, called a ViewSet. A ViewSet class is simply a type of class-based View. With this piece of code, we created a router object and register ‘/files/’ url extension. We want to use it for our API endpoint with also providing our viewSet. click on ‘files’ viewset that we defined. Here you can upload a file to test it out. Just choose a file and click on POST. You will notice that a folder with a name “media” will be created in the root directory and the file is uploaded under it.